Uh…Dorothy? We don’t think you’re in Oz anymore! This is one scarecrow who might care about getting a brain…but only if it’s yours! As if miles and miles of empty cornfields weren’t creepy enough, out pops this guy, horrifying and hellbent on murdering some innocent kids from Kansas with his rusty pitchfork! He could be any geek off the city street, but once he pulls on this Evil Scarecrow Mask, all of your Country Killt nightmares will be coming true! Made of latex, this mask makes your face look like a demented scarecrow and your skin look like a brown burlap sack (both of which are terrifying on their own, but together…?). 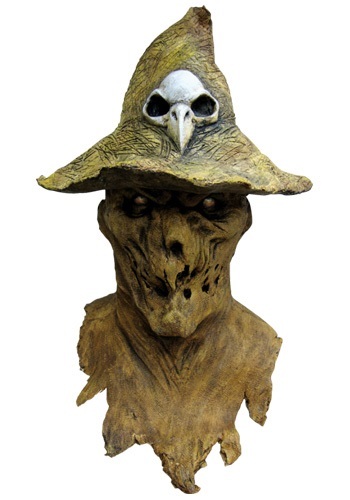 The mask also features a molded hat with a bird skull, for an extra terrifying touch. So if you see this Evil Scarecrow Mask out on the farm, don’t just ease on down that yellow brick road…RUN!